Interstate 5 spans the West Coast, originating at the nation’s busiest international border crossing at San Ysidro (San Diego), California, and culminating at Blaine, Washington. This freeway connects all of the major population centers of the western seaboard, including San Diego, Los Angeles, Sacramento, Portland and Seattle. Via Interstates 580 and 505, Interstate 5 provides freeway connections to the populous San Francisco Bay Area. Passing through the border inspection station, Interstate 5 immediately assumes the role of an urban freeway, with eight to twelve lanes for its entire length through San Diego County. The freeway replaces old U.S. 101, which used to follow surface streets between the border and Downtown San Diego. While some parts of the old road are buried (such as in National City, where it was overrun by the Mile of Cars and in La Jolla, where Interstate 5 was routed on top of the old road), many extant sections of U.S. 101 are still around for driving enjoyment, especially between La Jolla and Oceanside via San Diego County Route S-21. With the recent population explosion resonating throughout Southern California, eight-lane Interstate 5 is ill-equipped to handle the needs of daily commuters, visitors, business people, international tourists, truckers and more. Plans call for expansion of Interstate 5 in San Diego, for instance, to ten or more lanes, including the implementation of high occupancy vehicle lanes. One such project will add an HOV lane per direction from Manchester Avenue to California 78 during work between late 2015 and 2018 (see this document for details). This work precedes the planned construction of I-5 Express Lanes, from La Jolla Village Drive in San Diego to Harbor Drive in Oceanside. These will operate similarly to the I-15 Express Lanes through San Diego County. Work proposed between 2020 and 2035 will upgrade the existing carpool lanes to Express Lanes. One such large-scale project was the reconstruction and expansion of the interchange between Interstate 5 and Interstate 805 through the San Diego communities of Sorrento Valley (Mira Mesa), Torrey Hills and Carmel Valley. The freeway was widened to a dual freeway configuration, which allows for trucks and local traffic to use the lanes that lead to exit ramps, while through traffic may use the express lanes. The northbound local bypass opened in early 2006, followed by the southbound local bypass in spring 2007. Continuing north through Orange County, Interstate 5 was reconstructed and widened substantially in the mid-2000s between California 73 and California 91. Parts of this section of freeway contain as many as 22 lanes, including auxiliary and carpool lanes. Even so, the interchange between Interstate 5 and Interstate 405 can be very busy and congested during rush hour periods and on weekends. Entering Los Angeles County, Interstate 5 reverts to its originally constructed alignment, following concrete poured in the 1960s in some areas. Interstate 5 is generally six lanes wide. Construction underway expands the freeway northwest from Buena Park to Commerce. Work started between the Coyote Creek over crossing and Marquart Avenue in January 2012. Construction continues on Segment A through December 2018. Segment B between I-605 and I-710 and C at the I-710 interchange is proposed to start in winter 2025. For more, please see the official web page. One of the biggest congestion points along Interstate 5 is at its junction with Interstate 10, U.S. 101 and California 60. This maze of interchanges, ramps and other maneuvers remains largely unchanged since its original construction, and so it is overwhelmed by traffic every day. Through traffic on Interstate 5 is squeezed into two lanes at one point as well as merged with traffic from the busiest freeway in Southern California, Interstate 10 (the Santa Monica Freeway). From here, Interstate 5 generally follows old U.S. 99, which was decommissioned in 1964. Leaving the Los Angeles Basin, Interstate 5 regains its full freeway configuration of eight to ten lanes, but the evening commute generally hits at the north end of San Fernando Valley. The interchange between Interstate 5, Interstate 210 and California 14 is a choke point, even with the truck bypass. The California 14/I-5 interchange is also the site of two devastating earthquake collapses, one in 1971’s Sylmar Earthquake and the other in 1994’s Northridge Earthquake. Beyond San Fernando Valley, Interstate 5 ascends to one of the highest points along its journey along the western coast. Crossing the Tehachapi Mountains at Tejon Pass (elevation 4,144 feet) as well as the infamous San Andreas fault, I-5 transitions from an urban to a rural freeway for the first time in its northbound journey. In order to make the grade manageable for trucks, the northbound lanes of Interstate 5 just north of Castaic switches sides with the southbound lanes. The result is several miles in which northbound Interstate 5 is on the left side of the freeway rather than the right side! This kind of configuration is rare; Interstate 8 east of Yuma, Arizona has a similar inversion of its east and westbound lanes. Descending into the massive Central Valley via the Grapevine, Interstate 5 immediately splits into two routes: I-5 follows the Westside Highway, avoiding all major population centers between the Grapevine and Tracy. California 99 follows the old U.S. 99 route, connecting with most major Central Valley cities, including Bakersfield, Fresno, Modesto, and Stockton. Fresno holds the dubious distinction as the largest city in the country not served by an Interstate highway. Nevertheless, Fresno still has its old standby, California 99. Most traffic destined for the Bay Area and points northward prefer to take Interstate 5, which is shorter and avoids urban traffic. The next several hundred miles can be peaceful or stressful depending on the day of the week and time of year. During holiday weekends, Interstate 5 can be a parking lot filled with travelers eager to reach relatives and friends in Northern or Southern California. At other times, Interstate 5 is as free-flowing as any rural freeway. However, over the past decade or so, more people have been using “the 5” to connect between Southern and Northern California. As this kind of usage increases, more traffic delays become problematic in the Central Valley, even if the nearest city is many miles away. Once at Interstate 580, travelers en route to the San Francisco Bay Area may exit west to their destination. Interstate 5 remains in the Central Valley, closely following the California Aqueduct and Path 22, the flagship transmission power lines that follow the freeway through much of the state. Whenever Southern California needs power from Northern California, these power lines carry that extra power needed to satisfy their needs. The power lines also work in reverse, thus ensuring that neither part of the state is without power for a long period of time. Finally Interstate 5 passes through some cities in the Central Valley, including Tracy, Manteca, Stockton, and the capital city, Sacramento. By the time Interstate 5 reaches Sacramento, it has expanded to eight to ten lanes. Passing under Business Loop I-80, I-5 is well below grade … so low that the bottom of the nearby Sacramento River is higher than the level of the freeway as it passes by Old Town Sacramento. Occasionally, with significant amounts of rain and other variables, this section of Interstate 5 may flood. However, there are plans to change this. Some Sacramento leaders want to see their access to the river restored, and part of that would require removing Interstate 5 from between downtown Sacramento and Old Town Sacramento. I-5 would then be re-routed to the west, connecting with Interstate 80 and Business Loop I-80 in West Sacramento at their current interchange, then continuing northeast to rejoin current I-5 at the current I-5/I-80 interchange. This ambitious plan faces many hurdles, including major cost and environmental concerns, and nothing has been finalized. Interstate 5 leaves Sacramento almost as quickly as it arrived. Again meeting California 99, I-5 serves the west edge of the northern Central Valley (via old U.S. 99W), while California 99 and California 70 serve the east side of the valley (via old U.S. 99E and Alternate U.S. 40). Most of the towns passed by Interstate 5 are tiny, but they have seen growth through the addition of fast food restaurants, gas stations and motels. Behind the veneer of these services, old towns with a great deal of history and farming tradition — such as Williams, Arbuckle, Willows, and Orland — await. Passing through Red Bluff, Interstate 5 enters the rolling hills that separates Red Bluff from Redding. I-5 leaves the Central Valley, and glimpses of towering Mount Shasta become common. Changing from the great valley to mountain scenery, I-5 cuts towering mountains as it winds its way northward along old U.S. 99. This terrain remains similar as Interstate 5 passes through northern California and enters southern Oregon. By the time it reaches Eugene, the freeway has entered the narrow Willamette Valley, and it approaches Portland. 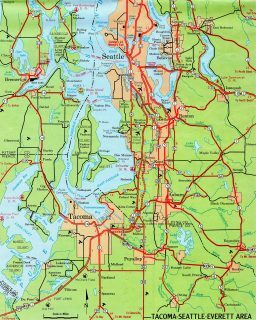 Both Portland and Seattle have several concerns with Interstate 5. In Portland, the Interstate Bridge over the Columbia River is substandard and causes traffic delays daily. 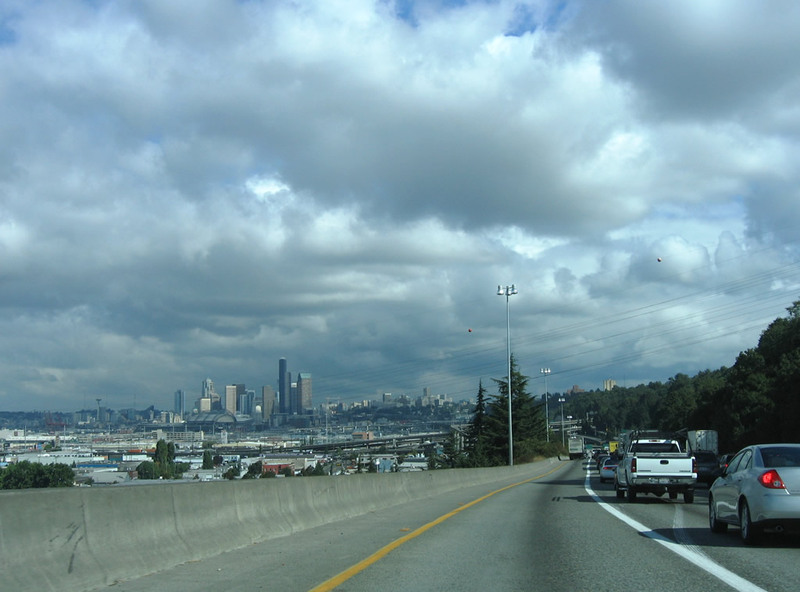 In Seattle, the freeway is congested daily and cannot support the ever increasing crush of traffic. 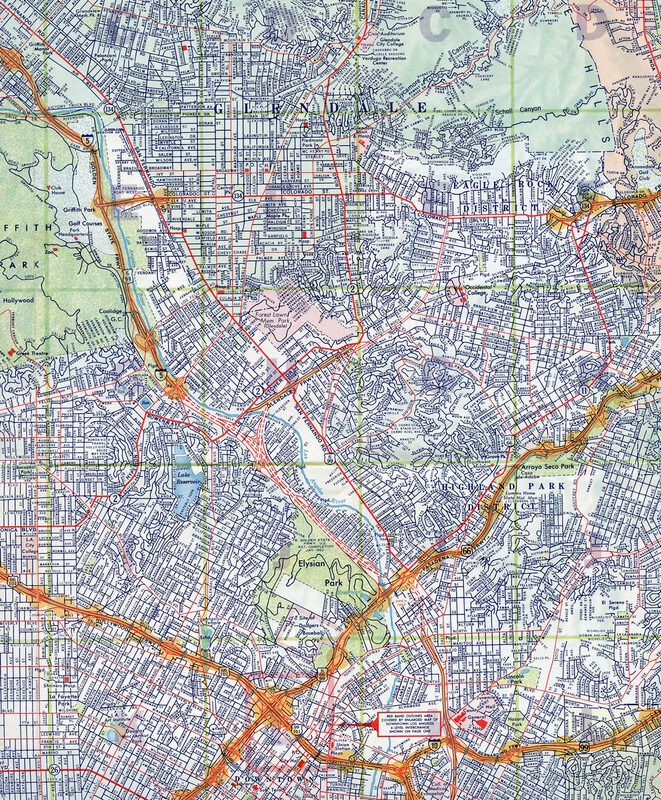 Interstate 5 is part of High Priority Corridor 30: Camino Real for its entire length. In the Everett-Seattle-Tacoma area, Interstate 5 is also part of High Priority Corridor 35: FAST Corridor. South of San Diego, Interstate 5 replaced U.S. 101, thus truncating that route in Los Angeles. However, for the rest of its journey northward, Interstate 5 roughly parallels and replaces former U.S. 99, which was decommissioned in stages between 1964 and 1972. Remnants of the old route are now part of California 99, Oregon 99, and Washington 99. Although Interstate 5 runs closely to the original route of U.S. 99, large sections of the freeway avoid the old alignment and take on a new alignment, especially between Wheeler Ridge and Manteca. Old U.S. 99 instead passed through Bakersfield, Fresno, and Modesto via modern California 99, while Interstate 5 stays clear of urban areas until reaching Stockton. In addition, Interstate 5 replaced U.S. 99W between Woodland and Red Bluff. Today Interstate 5 only intersects a handful of U.S. routes, and only three of them are in California (U.S. 101, U.S. 50, and U.S. 97). Ramp meters are used at interchanges of Interstate 5 through the Portland area. This particular assembly is south of Interstate 205. Photo taken 08/27/06. Ramp meters for Interstate 5 are also used in San Diego, Los Angeles, Sacramento, and Seattle. The Seattle skyline comes into view along a busy stretch of Interstate 5 northbound. Photo taken 08/30/06. The initial stretch of Interstate 5 built in the Seattle-Tacoma area bypassed U.S. 99 from 54th Avenue East at Fife to Washington 18 near Kitts Corner. 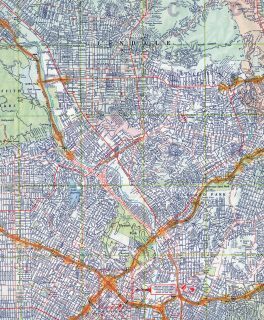 One of the final sections of Interstate 5 completed through Los Angeles was the stretch from Pasadena Avenue (Exit 136B) north to Glendale Boulevard (Exit 140), which opened between 1961 and 1962. The northern section of I-5 through Los Angeles was completed in 1963 between Lankershim Boulevard (Exit 152) and Interstate 210 (Exits 161A/B). 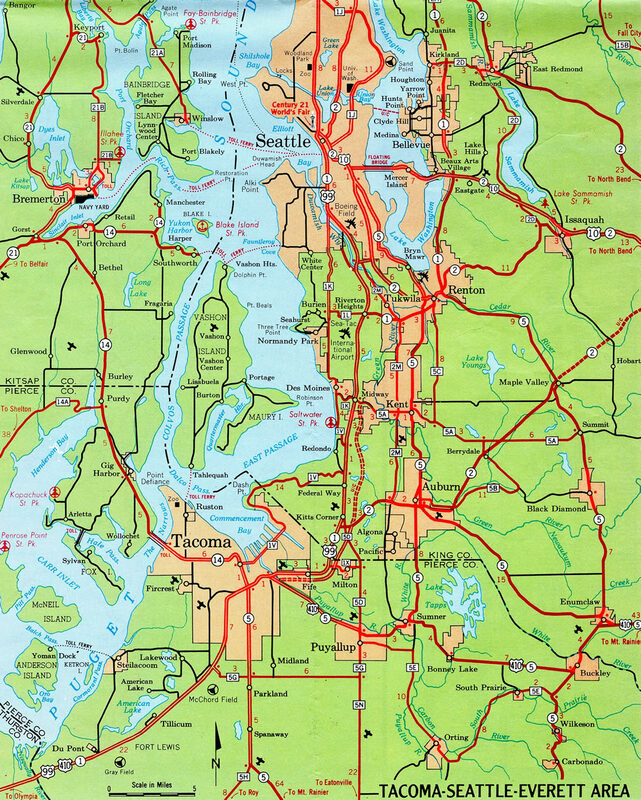 Interstate 5 was originally programmed to have one split route: Interstate 5W. Interstate 5W was to start near Vernalis, follow Interstate 580 to Oakland via Hayward, then return to Interstate 5 via Interstate 80 and Interstate 505 near Vacaville. A few shields were minted and posted, but the designation was eliminated in favor of Interstates 505 and 580. Now in the border city of Blaine, northbound Interstate 5 prepares to cross into Canada at the 49th Parallel. All commercial traffic must use Exit 275, Washington 543 (H Street) north to the Truck Customs. Personal vehicles may continue north on Interstate 5. Photo taken 08/30/06. This mileage sign provides the distance to Point Roberts, which is a small town situated at the end of a peninsula that is mostly in Canada but crosses the 49th Parallel into the United States (state of Washington). The only way to Point Roberts by land is via Interstate 5 north to British Columbia 99 north, then British Columbia 17 south. Point Roberts is one of a few areas that are not connected to the mainland of the United States without having to enter Canada. Photo taken 08/30/06. The freeway ends in three miles, when traffic on Interstate 5 shifts onto British Columbia 99 upon crossing the international border between the United States and Canada. Photo taken 08/30/06. For travels into Canada, follow Interstate 5 north to British Columbia 99 or Washington 543 north to British Columbia 15. Note the variation in fonts between the Washington highway shields and the British Columbia highway shields. All truck traffic must use Washington 543 north. Photo taken 08/30/06. Shortly after the first appearance of British Columbia highway shields, a “freeway ends one mile” sign is posted on either side of the northbound lanes of traffic. Photo taken 08/30/06. An auxiliary sign advises that all commercial and bus traffic must use Exit 275, Washington 543 north to the Truck Customs and British Columbia 15. Photo taken 08/30/06. A second sign advises of the provincial routes that are reached via either Interstate 5 (British Columbia 99) or Washington 543 (British Columbia 15). Photo taken 08/30/06. Northbound Interstate 5 reaches Exit 274, Washington 543 north to the Truck Customs and British Columbia 15. All commercial vehicles and buses must exit here. Continue north on Interstate 5 to the north Blaine interchange, Peace Arch State Park, and (for passenger vehicles only) British Columbia 99. Photo taken 08/30/06. The last interchange along northbound Interstate 5 is the junction with Washington 548 south to downtown Blaine (Exit 276). Photo taken 08/30/06. After Exit 275 (Washington 543 north to British Columbia 15), this sign advises northbound travelers that a customs and immigration station is one mile ahead, immediately after Exit 276 (Washington 548 south). Photo taken 08/30/06. Exit 276 is the last U.S. exit. This border crossing is much less well-traveled than the one that carries Interstate 5 south into Mexico, and this makes it easier to remain in the United States. All traffic wishing to remain in the United States should exit here. Photo taken 08/30/06. Peace Arch State Park contains the famous Peace Arch, which marks the boundary between the United States and Canada. It is jointly maintained by the two countries; use Exit 276 to the parking lot adjacent to the Peace Arch. A walking path leads from the parking lot to the arch, which is located in the median between the two sets of lanes on Interstate 5/British Columbia 99. The park that contains the Peace Arch is closed between dusk and dawn. Photo taken 08/30/06. The speed limit lowers to 35 miles per hour as Interstate 5 approaches its final interchange and the border crossing into Canada. Photo taken 08/30/06. Northbound Interstate 5 reaches Exit 276, Washington 548/Peace Portal Drive south to Blaine and D Street east to Washington 543 (the spur route north to Truck Customs). This is the final exit from northbound Interstate 5 prior to the border crossing. Photo taken 08/30/06. Upon exiting, travelers en route to the Peace Arch should continue straight ahead from the exit ramp into the state park parking area. There is no fee for day use. Overnight activities at the Peace Arch are prohibited. Turn left to follow Washington 548/Peace Portal Drive south into downtown Blaine. Turn right to connect with Washington 543 via D Street. Photo taken 08/30/06. After Exit 276, another sign advises of the pending Customs and Immigration Station. Nexus Lane permit holders may use the newly formed right lane. Photo taken by Steve Hanudel (05/20/06). A sign cautions bumps over the next one-half mile, and a series of scanners and related equipment span the northbound lanes for participants in the Nexus program. Photo taken by Steve Hanudel (05/20/06). On the east side of the northbound roadway is a Washington State Parks sign for Peace Arch State Park. The speed limit remains 35 miles per hour, and this small park is located between the two customs stations (one for the United States, the other for Canada). Pedestrians are permitted to walk across the highway to view the Peace Arch (which is visible in the background), and a crosswalk cuts across the northbound lanes between the state park parking area and the arch. Photo taken 08/30/06. The Peace Arch Park comes into view as Interstate 5 ends. There is no end shield or any kind of signage to that effect. However, the Peace Arch itself, which resides in the median of the highway, comes into view from behind a canopy of trees. This fenceless area allows visitors to walk around the arch, which in effect allows visitors to the park to visit the other country briefly. However, all who wish to enter Canada from the United States (aside from the Peace Arch Park) must pass through the Customs and Immigration Station. Photo taken 08/30/06. Small stone markers along each side of the connecting highway between Interstate 5 and British Columbia 99 indicate the border between the United States and Canada. The Peace Arch, which is partially obscured by trees, parallels the line marked by the stone markers. Photo taken 08/30/06. A “Think Metric” sign is posted as the northbound lanes cross from the United States into Canada. The Customs and Immigration Station is located on the hill beyond this sign. Welcome to British Columbia! Compare the expanse of green, trees, and nearby ocean with the concrete and tall walls that constitute the border between the United States and Mexico at Interstate 5’s southern end. Finally, note the Peace Arch Park sign in the background, which has the words “British” and “Columbia” on the logs that hold up the Peace Arch Park sign. Photos taken by AARoads (08/30/06 and 08/27/00). Near the two border posts on northbound, an adjacent small plaque celebrates the openness of the United States-Canada border. In part, it reads, “This unfortified boundary line between the Dominion of Canada and the Dominion of Canada should quicken the remembrance of the more than a century old friendship between these countries a lesson of peace to all nations.” The plaque was erected by the Kiwanis International, first in 1936. An additional plaque was installed in 1965 to commemorate “150 years of peace (1814-1964) between Canada and the United States of America [and] the signing of the Columbia River Treaty of September 16th, 1964, at this International Peace Arch by the President of the United States, Lyndon B. Johnson, and the Prime Minister of Canada, the Right Honorable Lester B. Pearson P.C.” Photo taken 08/30/06. 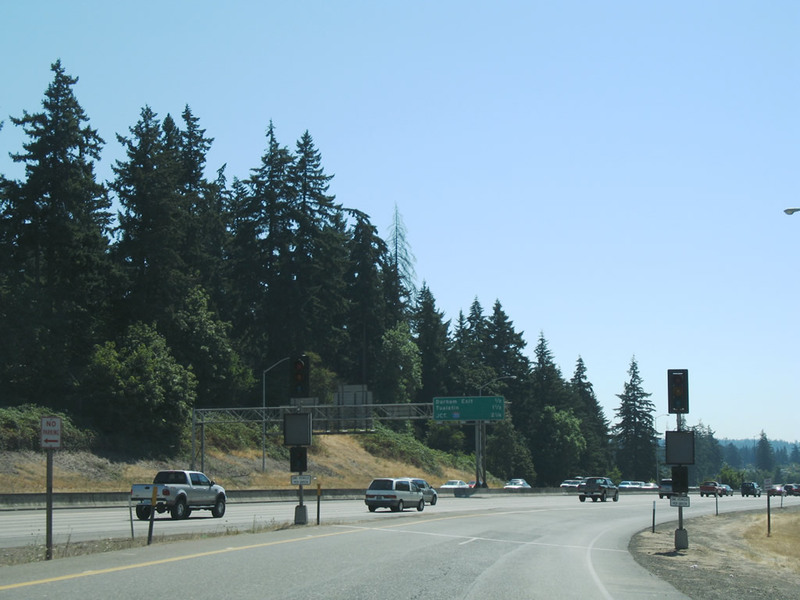 Looking east from the spot of the monument/plaque in the previous photobox are the boundary markers that straddle the northbound lanes of Interstate 5/British Columbia 99. The words “Treaty of 1925” and “International Boundary” are inscribed into the two granite monuments as well as the names of the two countries. The houses on the bluff are in Canada; for some of them, their roadway access is from Avenue 0 (Zero), which follows the international border to the east. No fences separate Avenue 0 from the United States and the Peace Arch State Park. Photo taken 08/30/06. Interstate 5 transitions directly onto British Columbia 99 upon crossing the International Border. Prior to the mid-1960s, the numerical designation between the U.S. and Canadian routes was the same: U.S. 99 and British Columbia 99. With the renumbering of U.S. 99 as Interstate 5, British Columbia decided to keep its 99. As such, 5 changes into 99 at this point. The customs and immigration station is just ahead. Photo taken 08/30/06. After passing through customs, traffic is funneled through the station. This stop sign marks the point where all traffic merges back together. A City of Surrey sign welcomes motorists into British Columbia. Photo taken by Steve Hanudel (05/20/06). A yellow, white, and blue sign welcomes travelers into British Columbia with the feature of the sun rising over the mountains. A visitor information center is available at the first turnoff, and a U-Turn is available for those wishing to return to the United States. Photo taken by Steve Hanudel (05/20/06). The reassurance shield for British Columbia 99 appears on the first exit sign along northbound. This exit serves the city of Surrey is signed as Exit 2, immediately after the visitors information center. Note that all signs are in metric rather than English (kilometers and meters rather than miles and feet). Photo taken by Steve Hanudel (05/20/06). Northbound British Columbia 99 meets Exit 2, 8th Avenue. This interchange is configured with a long deceleration lane and demonstrates that the freeway continues north of the international border. British Columbia 99 continues as a freeway all the way to Vancouver. Photo taken by Steve Hanudel (05/20/06). Interstate 5 through Washington State is designated part of the Blue Star Memorial Highway in honor of those who have served in the Armed Forces. The particular plaque is positioned southwest of the Peace Arch. Note the southbound traffic adjacent to the plaque. Photo taken 08/30/06. While somewhat hidden by the towering trees that sit on either side of the Peace Arch, it is dominant in its own way. The arch acts as a large doorway, connecting the United States and Canada. Travelers waiting to enter the United States on the southbound lanes have a better view of the arch due to the slope of the road and position of the trees. As compared to Canadian customs, many waited patiently in line to enter the United States. However, this is not always the case. During times of peak flow, the northbound lanes may be equally congested. Photo taken 08/30/06. Again looking north through the Peace Arch, flags for the United States and Canada fly proudly on the south and north ends of the arch, respectively. The phrase “Children of a Common Mother” refers to the history of both countries once belonging to the British Empire. (The British Columbia highway shields (see British Columbia 99’s shield above) for that matter may remind one of the old phrase, “the sun never sets on the British Empire.” Photo taken 08/30/06. Now underneath the Peace Arch, phrases on either side of the arch are: “May these gates never be closed” and “1814-1914: Open One Hundred Years.” The wrought iron, black gates are permanently affixed to the walls of the Peace Arch. Photos taken by AARoads (08/30/06). Now looking south at the Peace Arch, the inscription the Canadian sign reads, “Brethren Dwelling Together in Unity.” The Canadian flag shines brilliantly in late summer sunshine. This photo was taken from Canadian soil. Photos taken by AARoads (08/30/06 and 08/27/00). On the north face of the Peace Arch is a small inscription honoring the Pacific Highway, which in 1920 was constructed to pass through the peace park. We were still in Canada when taking this picture. Photo taken 08/30/06. Again looking north from the Peace Arch is a beautiful green lawn. When we visited, a grounds maintenance worker was cutting the lawn, driving his mower north and south across in large swaths. A flower arrangement adjacent to the Customs and Immigration Station created the Canadian flag; a similar arrangement was made for the flag of the United States of America. Photo taken 08/30/06. Prior to reaching the customs house for the United States of America, a welcome sign depicting a series of national attractions is posted. These attractions include (from left to right): Statue of Liberty (New York City), U.S. Capitol Building (Washington, D.C.), Gateway Arch (St. Louis), Mt. Rushmore (South Dakota), Golden Gate Bridge (San Francisco), and the Space Needle (Seattle). Countless other attractions are omitted, but there’s only so much that can fit on one sign! This sign is found immediately after the boundary markers and is the official start of southbound Interstate 5. Photo taken 08/30/06. The U.S. Customs Station is located along southbound Interstate 5 after the international border. All traffic must stop. Photo taken 08/30/06. After the border crossing, Interstate 5 assumes a rural configuration. After Exit 276, Washington 548 south to downtown Blaine, the highway has four lanes. Milepost 276 is the first southbound mile marker. Photo taken 08/30/06. This is the first reassurance shield on southbound Interstate 5. Photo taken 08/30/06. A Welcome to Washington sign is posted after the first Interstate 5 reassurance shield along southbound. Photo taken 08/30/06. This mileage sign provides the distance to Ferndale (12 miles), Bellingham (21 miles), and Seattle (110 miles). It would be nice to see a distance to the southern terminus in San Diego, California, but this is still more than what is provided at the southern end along northbound Interstate 5! Photo taken 08/30/06. Westbound D Street transitions directly onto Peace Portal Drive (Washington 548) south. The diamond interchange with Interstate 5 features a northbound control city of Vancouver, B.C., and a southbound control city of Seattle. No British Columbia 99 signs are present at this interchange. All traffic turning north onto Interstate 5 at this point will cross into British Columbia. Photo taken 08/30/06. A second sign advises of the junction with Interstate 5 south to Seattle. Continue straight ahead to follow Washington 548/Peace Portal Drive south into downtown Blaine. Photo taken 08/30/06. An oversized Interstate 5 trailblazer points the way from D Street/Peace Portal Drive onto southbound Interstate 5 to Seattle. Photo taken 08/30/06. Interstates 5 and 805 terminate at the International Border with Mexico in the San Diego community of San Ysidro. The final exits along southbound are for Via de San Ysidro and Camino de la Plaza. Photo taken 05/22/04. Interchange sequence sign listing the last departure points from I-5 south: Exit 1B to Via de San Ysidro and Exit 1A to Camino de la Plaza. The border crossing lies 1.25 miles ahead. Photo taken 05/22/04. Exit 1B departs I-5 south for Via de San Ysidro. Four lanes advance southward to the Mexico border crossing. Photo taken 05/22/04. Interstate 5 ends in 0.75 mile; if Mexican officials are stopping traffic at the border, delays may occur even as far north as here. This border crossing is the busiest in the country due to the commuter and commercial traffic crossing its gates every day. Photo taken 05/22/04. The last U.S. exit connects I-5 south with Camino de la Plaza to various outlet shops, duty free businesses, parking areas, a transit center and the pedestrian walkway into Mexico. Photo taken 05/22/04. With the exception of a U-turn lane to the left, all remaining traffic along Interstate 5 south beyond Exit 1A defaults is defaults to the customs station for Mexico. Photo taken 05/22/04. Traffic from Interstate 805 merges onto Interstate 5 from the ensuing overpass. Travelers headed into TiJuana, Mexico with items to declare are advised to use the right lane at the upcoming customs station. All other lanes are subject to random searches at the request of officials. Photo taken 12/03/06. The left lane partitions ahead of the San Ysidro port of entry for the last U-turn back into the United States. The remaining four lanes continue south across the International Border to Tijuana, Baja California, Mexico. Photo taken 12/03/06. A concrete barrier separates the U-turn lane for Interstate 5 north from the queue lanes for the international border crossing. Photo taken 12/03/06. This “U-Turn to USA” sign marks the point where motorists turn north to enter the left lane of northbound Interstate 5. Photo taken 12/03/06. Traffic partitions to the immediate north of the port of entry/customs station at the Mexican International Border and the on-ramp from San Ysidro Boulevard for Interstate 5 north and Exit 1A to Interstate 805 north. Photo taken 05/22/04. Interstate 5 remains closer to the bay and the Pacific Coast, while Interstate 805 travels through the inland communities of the San Diego metropolitan area. The two freeways rejoin in the northern San Diego neighborhood of Sorrento Valley. Photo taken 05/22/04. Interstate 50th Anniversary: The Story of Oregon’s Interstates by the Oregon Department of Transportation, as compiled from a 2004 report entitled “The Interstate Highway System in Oregon, An Historic Overview” by George Kramer. California Celebrates 50 Years of the Interstate Highway System by Caltrans (California Department of Transportation). San Ysidro LPOE Project Facts, U.S. General Services Administration web site. Page updated July 7, 2015.